One of the commemorative pylons on the Legacy Walk in Chicago’s Boystown—the first officially recognized gay village in the United States. Photo: Max Anderson | FlickrCC. 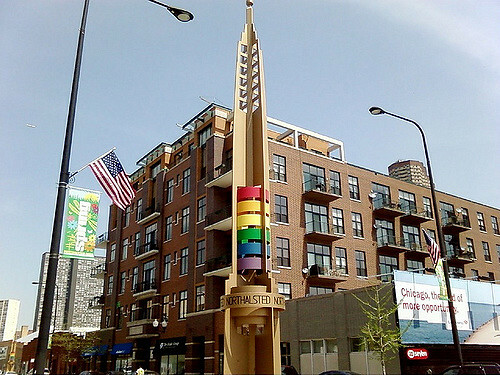 Boystown in Chicago was the first officially recognized gay village in the United States. Today, it’s a bustling and gentrified commercial district full of business and family life. Through the center of it runs the corridor of the Legacy Walk, a bronze-and-rainbows themed section of North Halsted Street, the area’s main artery. In the past four years, art deco pylons have gone up in rainbow colors, each featuring a bronze plaque with the name of an LGBT notable, most of them Chicago-based. Thirty-five pylons have been built so far, with more planned. But the organizers of the Legacy Walk have higher aims. The Legacy Walk is teaming up with the organizers of Chicago’s Pride Fest to set up a permanent museum and visitor’s center right in the heart of Boystown, hoping to cement its visibility as a tourist destination. Allied with local businesses and supported by grants and special events, the museum would be aimed at education and awareness. The Legacy Walk already oversees a youth outreach program; now that would have a home. The museum has been in talks since 1998, but things are finally moving forward, pushed in part by the fact that the Legacy Walk is simply running out of room. They have the rights to 37 sites – 35 are full. Bronze plaques will have to begin to cycle out. The museum will be the place they cycle too as new names are featured. There’s no location settled on yet, but all involved are set on the new museum being located on Halsted Street.